BioRegional has been formally recognised in the Queen’s New Years Honour List for 2013, by the UK Government for the use of One Planet Living at the London 2012 Games. Co-founders Pooran Desai (OBE) and Sue Riddlestone will be presented to the Queen to receive the honours in February 2013, where Sue will also be presented with an OBE. One Planet Living is a vision of a sustainable world, in which people everywhere can enjoy a high quality of life within the productive capacity of the planet. It uses ten principles of sustainability as a framework, developed out of the BedZED eco-village. BedZED, opened in 2002, is a mixed-use sustainable community, comprising 100 homes, some community facilities and workspaces for 100 people. 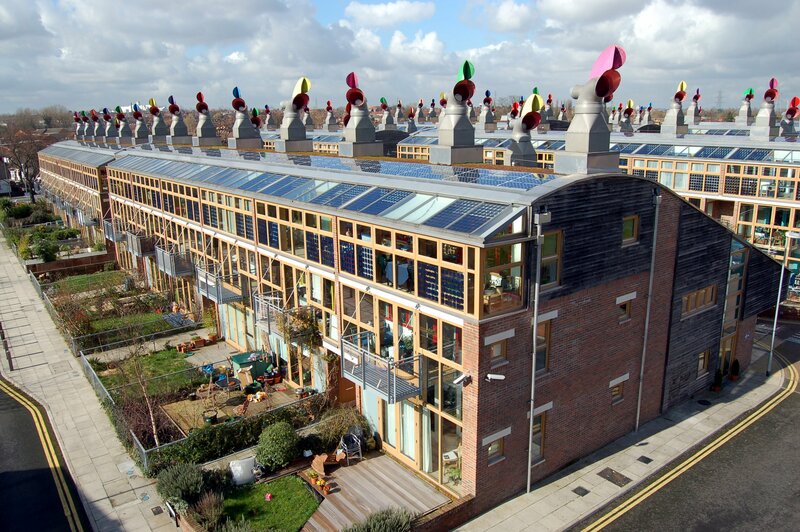 It is internationally renowned as one of the first carbon-neutral communities in the United Kingdom using only energy from renewable sources generated on site. Ed Cotter, Managing Director of BioRegional Australia welcomes the UK team to Australia again this February with events planned for the Sustainable Living Festival in Melbourne and Geelong. While Pooran Desai was in Australia November 2012 to speak at a number of conferences in Melbourne and Sydney he was also able to award three Australian projects with One Planet Living status. This included Stage 2 of the WestWyck eco-village, and the Commons, a residential mixed use development in Melbourne. This February, Ben Gill, Head of the One Planet Living’s International Program, will come to Geelong to give a lecture on how to achieve One Planet Living developments and a breakfast and workshop on how to achieve One Planet Living businesses. Whilst the One Planet Living framework and ten principles were derived from the BedZED eco-village, today they are utilised by varying development types, organizations, government and events such as the London Olympics. The One Planet Living framework is applicable as an action plan, business indicators and a reporting mechanism, which is quickly becoming recognized internationally as a simple alternate, to more complex annual reporting. Ben Gill has led the development of One Planet Living – Sustainability Action Plans on iconic sustainability projects such as One Brighton (UK), Masdar City (UAE) and Barangaroo (Australia). He is also BioRegional’s ‘Chief Scientist’ responsible for the footprinting methodology used to ensure that globally all endorsed One Planet Projects are on track to meet the Common International Targets. Ben represents BioRegional on the One Planet Living – International Expert Panel, and is a Director for BioRegional America and BioRegional Australia. Ecological footprinting shows that if everyone in the world consumed as many natural resources as the average person in Australia or Western Europe, we’d need three planets to support us. In China and South Africa the overall average is one planet, but this disguises considerable variations between different regions and lifestyles. One Planet Living is a positive vision of a world in which we are living happy, healthy lives, within the natural limits of the planet – wherever we live in the world – and we have left sufficient space for wildlife and wilderness.